Wine, food, and sometimes travel. Does it get any better than that? What countries are represented in your wine cellar? Just for fun, I decided to look at the bottles of wine I have in my "cellar" (aka the wooden wine rack in my dining room) to see what countries they were from. It actually was a very enlightening experience because I realize that I need to branch out and I promise that on my next wine buying jaunt, that's what I'll do. Out of the 21 bottles of wine I have on hand, 13 are from California, 4 are from Australia, 2 are from Italy, and I have 1 each from Argentina and South Africa. 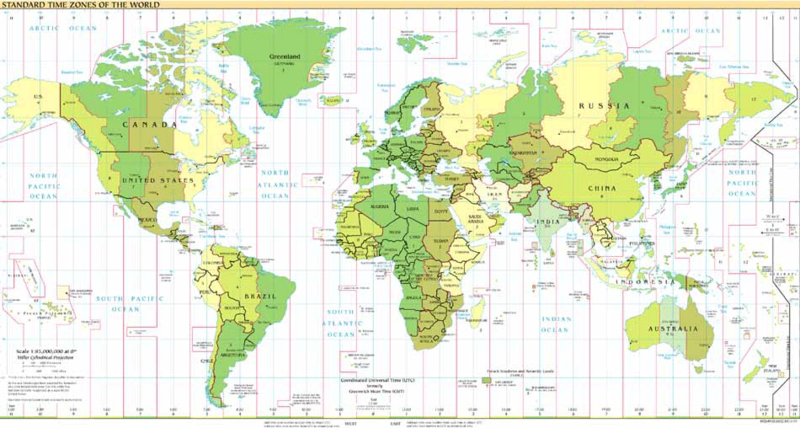 That leaves a lot of the world unexplored. I realize that this is my typical wine buying pattern -- I tend to stick to California and Australia/New Zealand wines, with an occasional Italy or Long Island wine thrown in for good measure. I don't seem to drink much French wine these day. Why is that? I'm not sure. For a while I was extremely fond of Clos de Bois -- which I THOUGHT was French because of its name, but it turned out to be a California wine. On my list for my next shopping trip - wines from Spain and France. Have you ever bought a wine just because you liked the look of the label? Come on - of course you have. Such was the case for me and this pinot noir. Something about the bottle - the cheerful sun and yellow label - just spoke to me. Pinot noir is an interesting wine in general - thinner than its red cousins, Merlot and Cabernet - but with rich and interesting flavors. I read in "The Wine Bible" that pinot noir grapes are the most difficult to make into wine because they mutate easily, are highly sensitive to climate and soil variations, and are unstable during winemaking. This has to make you respect a bottle of Pinot Noir all the more. Was this made from grapes? which drew me in with its cheer. Put this in the strange but true news category. A Reuters story, published on Yahoo News yesterday, revealed that monkeys in the Budapest Zoo in Hungary drink 55 liters of red wine a year. 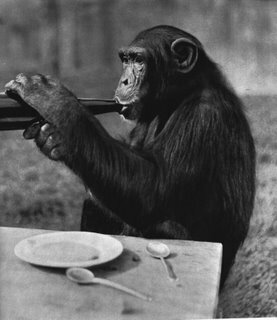 Apparently the apes are given small amounts of wine each day to boost their blood cells. My very favorite part of this story was the quote from a Budapest Zoo spokesman, who said "Obviously, they do not have it all at once and get drunk, but they get it in small amounts mixed in their tea." TEA?? Since when are monkeys drinking tea?? Thank you to Jen for bringing this story to my attention. I'm a big believer in the theory that you don't need to spend a lot to get a good wine, so I had hopes for a new wine that we tried this past weekend. 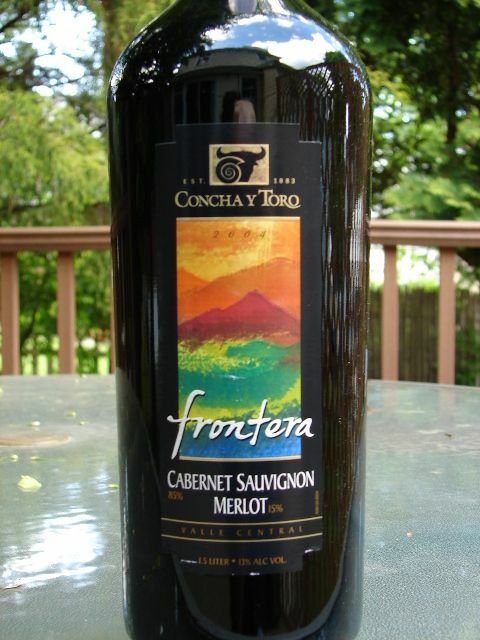 The brand name is Concha y Toro (which translated means Shell and Bull) and it hails from Chile -- where many reasonably priced, and sometimes tasty, wines can be found. This one wasn't really one of them however. It was a cabernet (85%)/merlot (15%) blend, which I often like. Blends can sometimes be interesting -- combining the best qualities of both types of grape. There is an Australian winery - Black Opal - that makes a nice cab/merlot blend... but I digress. The label on this wine described it as "ready to drink now" and "perfect to celebrate everyday victories." I think it was probably ready to drink last week, and it didn't improve in the meantime. It tasted alcoholic, but with little fruit. It certainly wasn't the worst wine I'd ever had, but I'd describe it as mediocre. It probably would make a fine base for summer sangria, but I likely won't bother getting it again to drink straight. I hate that adage that "you get what you pay for" but perhaps it was unfair of me to expect a 1.5 liter bottle of wine that cost barely over five dollars to be a standout. Cesasr and Rosa Mondavi purchased the Charles Krug winery in 1943 and ran it as a family business for 20 years. However, two of their sons - Peter and Robert (only 14 months apart in age) - had constant battles on how the winery should be run. Peter was the more conservative brother, Robert the more risk-taking. The two finally came to blows (literally, they had a fist fight) in 1965, followed by a court battle, which resulted in Robert Mondavi at 52 years old starting from scratch with his own winery. So actually there is a major connection between the two Mondavis! The really interesting thing is that after years of not speaking, both Mondavi brothers, now in their 90's, decided to reunite as a symbolic gesture to make one last barrel of wine together. According to an Associated Press story, the new wine is a cabernet blend made "half from grapes from Peter Mondavi's Yountville vineyards and half from the Robert Mondavi Oakville ToKalon vineyards." Don't expect to find this one in stores folks - the one barrel was auctioned off at the 2005 Napa Valley charity auction for $401,000, and will be ready to drink this August. (Boy, would I like to get my hands on a bottle of that!) But at least it's a happy ending for the brothers, who chose a fitting name for the final wine - "Alcora Una Volta" which translates to "Once Again." Want to learn more about the brothers and their fight? Click here to listen to an NPR story on the topic. Interested in reading the description of the $401,000 wine that was auctioned off? Click here and scroll down to #3 - it's worth a read. Okay - but why the term "toast"? 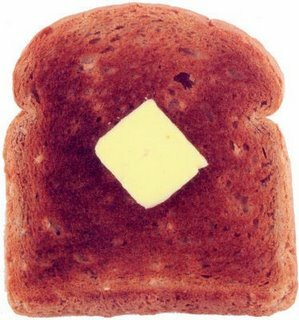 According to the same source, ancient Romans would drop pieces of burnt bread into their sub-par wine to make it more palatable. I can't swear to the veracity of this, but it sure makes a good story! "Wine is life" --- Petronius, Roman writer. Robert Mondavi and CK Mondavi - Separated at Birth? 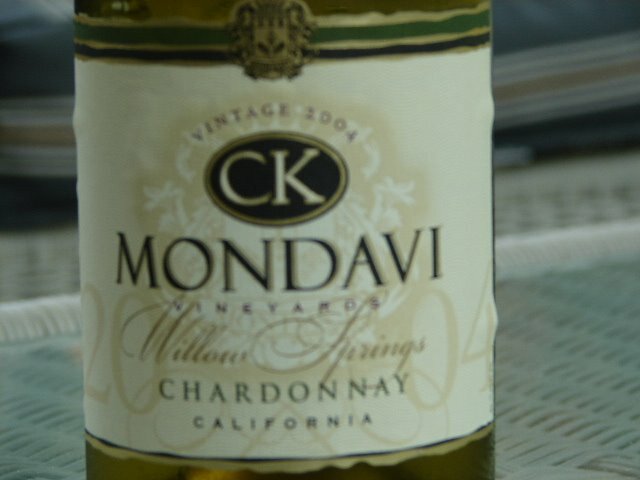 Last weekend I wrote about the CK Mondavi Chardonnay that was a hit with the Mother's Day crowd. Today I started thinking about Mondavi. Everyone knows the name "Mondavi." It's synonymous with good wine. But until today it never occurred to me (silly me) that there are actually TWO Mondavi wine producers in California - Robert Mondavi and CK Mondavi. 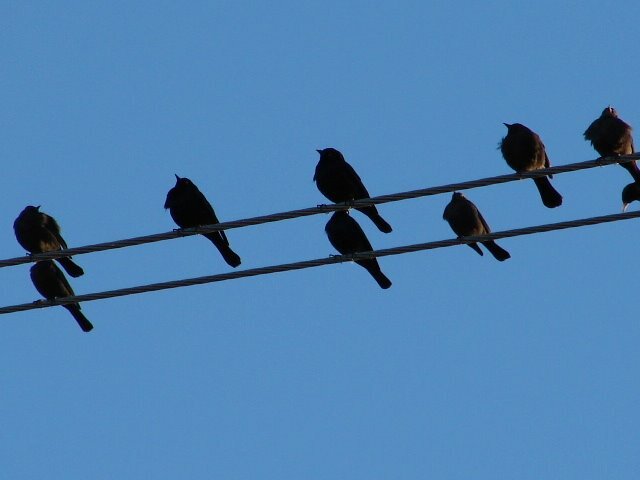 I just assumed that all Mondavis were the same. 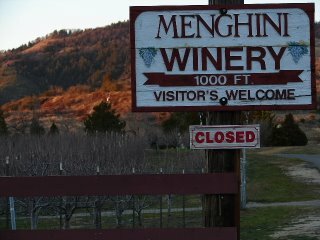 After doing some Internet research today however, I realized that the two wineries, though both sharing a last name and a state in common, are completely unrelated. Robert Mondavi has been making wine since the 1960's in Napa Valley. CK Mondavi began in 1943 as the winery of Italian immigrants Cesare and Rosa Mondavi who bought the Charles Krug (hence "CK") winery in St. Helena. Both are family wineries... but despite the same name, it's a different family. This info was kindly confirmed by the proprietors of XTC Wines in Port Washington, Richard and Marilyn, who I ran into at a seminar at the Port Washington Public Library. Mark and I will be going to Napa/Sonoma for a week in July, so I hope to check out both Mondavis and report back! 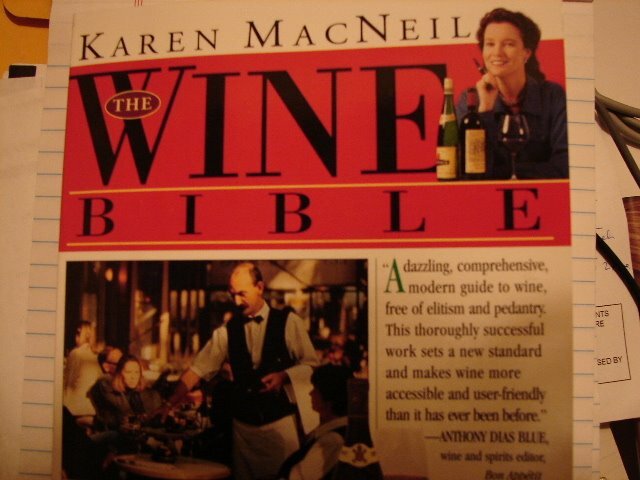 I was reading Karen MacNeil's excellent book, "The Wine Bible" recently. This is a great book for people who want to learn about wine from A to Z, and it's especially good for beginning wine connoisseurs. In her section on how to pick the right wine shop she writes "In my experience the best wine shops are those with newsletters. By a newsletter, I don't mean a price list. I mean a real newsletter that describes wines well enough so that you have a pretty good idea of what they taste like. Reading a shop's newsletter is not only a painless way to make new wine discoveries, but just reading the thing will give you a sense of the personality of the shop and whether or not it has a style and an approach you like." This is valuable advice, and over the past months I've been visiting various wine stores to examine and assess their newsletters. Surprisingly many, perhaps most, wines stores do not have newsletters at all. Or they use some generic newsletter that doesn't give any store-specific information. Other wine stores offer catalogue type things, rather than a newsletter. One, in particular, was huge (24 or more pages) and used at least 15 different fonts and a horrible color scheme of red and green. It was appalling to read -- busy and nauseating -- but the real kicker was that the store had neglected to put its address anywhere in the catalogue!!! We couldn't go there even if we wanted to! As a freelance writer who has done numerous newsletters in the past, I take particularly great interest in this phenomena. Why don't stores invest in this sort of marketing? Why do they feel that it is something that they can give to their high school kid to do? Given a choice of a wine shop with an informative, engaging newsletter and one without, I'd go to the one with the newsletter because I would feel that I'm getting something extra. Why aren't ALL wine stores investing in professional help with this? [Of course, I have a vested interest - I'd like to be the professional help.] Own a wine store? Want a professional newsletter? Email me. Tonight I'm drinking a wine that has become one of my recent favorites. Steel Creek Viognier 2004 from California. I stumbled on this quite by accident. We were visiting some friends, and brought a bottle of wine (I can't remember what wine, unfortunately). After finishing that bottle, our hostess Janet (who along with her husband Scott are also very interested and knowledgeable about wine) brought out a bottle that they'd been drinking and poured us a glass. I was struck by this wine immediately. The taste was unusual - fruity but not sweet, with a rich, almost tropical flavor. I sensed pineapple, asian pear and apple. It was refreshing and rich and flavorful -- good for drinking alone, or with the olives and spreads that Scott and Janet provided. I immediately wrote down the name of the wine and have been drinking it since. 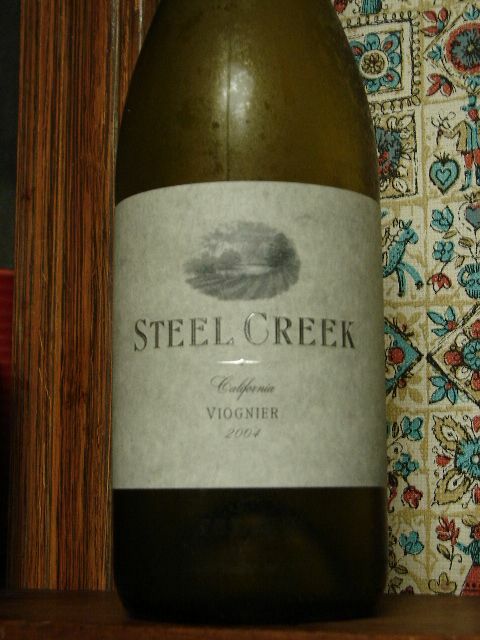 The label describes it as having a "golden straw-yellow hue with rich honeysuckle and pineapple aromas. Delicious flavors of pear, peach, and tropical fruit are followed by a lingering, expansive finish." This was a very good description in my opinion. I try to always drink the wine first, write down my own impression, and THEN read the label. In this case, the label and I overlapped on many points. 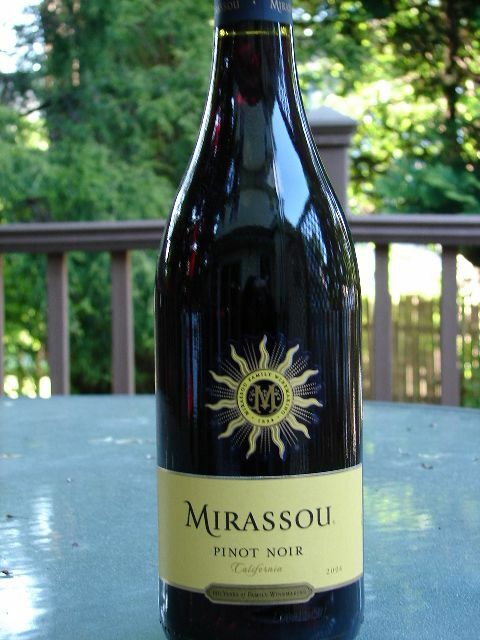 This is a reasonably priced (I paid $7.99 a bottle), great wine, perfect for Spring/Summer drinking out on the deck. Dieters - here's something to drink to. According to the May/June issue of Weight Watchers Magazine, "recent research found that people who had one or two alcoholic drinks per day were 54 percent less likely than teetotalers to be obese." Before you drink that whole bottle however, it's worth noting that the same article also said that those who have more than four drinks a day "increased their risk of being obese by 46 percent." So stick with one or two glasses at most. A glass of wine with dinner is not just civilized... it's good for your diet! 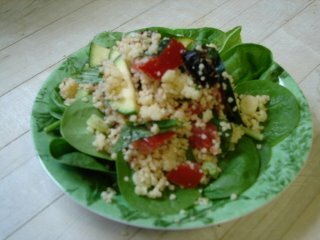 For the Mother's Day Celebration, I made a couscous salad that I adapted from a recipe on the back of a box of Near East Couscous. Here is my version - it's light, flavorful, and would make a great light lunch heaped on a bed of lettuce with a glass of that CK Mondavi Chardonnay on the side. Prepare the couscous according to the box, but leave out oil and salt, and add black pepper to the cooking water. When couscous is done, fluff with fork and pour into a large bowl. Add olive oil and lemon juice and mix. Allow to cool to room temperature. Mix in zucchini, green onions, basil, tomatoes and olives. Toss well, cover, and chill for at least 4 hours, or overnight. Note - if you substitute cucumber for zucchini, and parsley for basil, and add a little extra lemon juice you will have a variation that is very much like the middle eastern salad tabboulli. Good stuff! We started with a CK Mondavi 2004 Willow Springs Chardonnay. You probably heard of Mondavi, a California winery that is reliable in its production of good wines. This chardonnay was no exception. I would describe it as bright, fruity, smooth and crisp. It wasn't sweet, but wasn't bone dry. It was light and was pleasant drinking, even without food. A testament to this wine was the fact that everyone liked it. My dad, the former Manischevitz drinker, gave it a thumbs up. (He would like me to note, by the way, that although he does like Manischevitz and White Zinfandel, he's expanded his vistas and has also incorporated chardonnay into his repertoire. He's not keen on Pinot Grigio though.) Jen's dad, Kent, who is actually a wine connoisseur also gave the Mondavi a thumbs up. It's the sort of wine that you can't go wrong with -- the perfect bottle to bring to dinner. The second wine, however, created many a wrinkled nose. (Well, mine was wrinkled in any event). 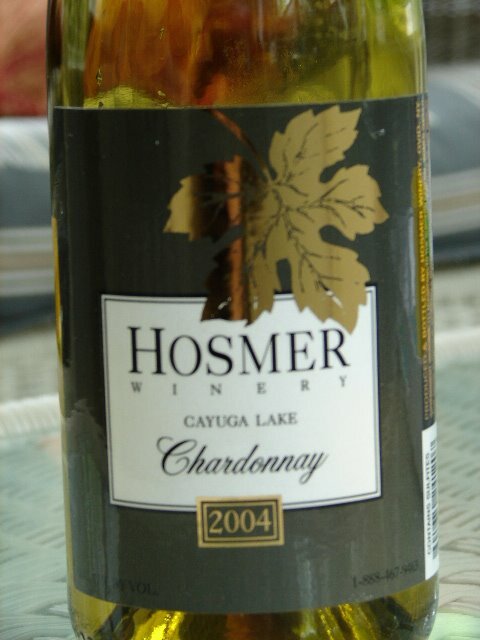 It was a Hosmer Winery Cayuga Lake Chardonnay 2004. Being a New Yorker, I hate to denigrate a New York wine... but this chardonnay did not come close to the Mondavi. It had a darker color, strong sharp aroma, and sweet, fruity/grapey taste with a sharp edge and a lot of oak. I didn't enjoy drinking this without food, and even the hot dog I was eating couldn't overpower the taste of that wine. (Ok, I know I shouldn't be eating a hot dog with a chardonnay - mea culpa). Cayuga Lake is upstate New York. There are a number of wineries there, and I've been to a few in the Finger Lakes. They are great to visit for entertainment value, and some of them have unusal varieties that lend themselves to the climate - like a Riesling perhaps. But word to the wise, leave the chardonnay to California. In my last post I mentioned that we visited the charming little mountain town of Julian, CA, where there are several wineries and tasting rooms. But I realized I left out an important place to stop while you are there. Tasting wine is wonderful... but so is tasting chocolate. Luckily, Julian has both. The King Leo Candy company is located in Julian, conveniently next to the Orfila Vineyards tasting room! Mark and I stumbled over there after our excellent wine tasting. 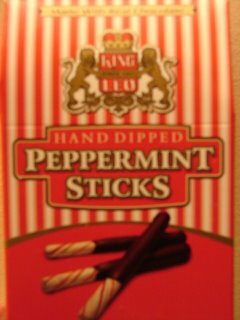 As you may know, King Leo is famous for peppermint sticks - specifically, peppermint sticks dipped in chocolate. And they give free samples at the store. While there, I tasted another of their specialties - peppermint bark. Usually seen mostly around Christmas, you can get some bark for your bite all year round at King Leo's factory store. Oh, and did I mention the free samples? In January 2006, my husband (Mark) and I went to San Diego to visit his sons. 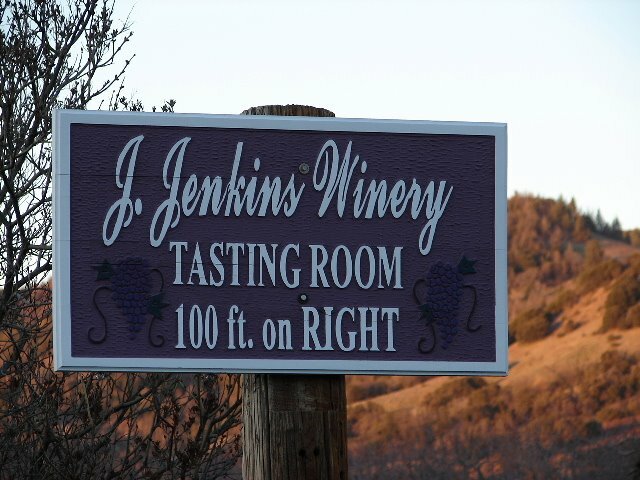 While there, we took a quick day trip to a different California wine town than most people are familiar with - far from Napa and Sonoma is the tiny town of Julian, CA. Julian is about an hour east of San Diego, which made it perfect for a quick, half-day detour. The town itself is small and charming, with a main street lined with little shops and inns. There are several wineries in the area, although we only had time for one tasting room. [More on that in another post]. Julian is a historic gold-mining town, founded in the 1870's. Nestled in the mountains, it's a scenic and relaxing drive from San Diego -- well, it was for me, I wasn't the one driving! The town appears to be the perfect setting for a romantic weekend. If I lived in the San Diego area, I would certainly consider it a perfect getaway. For more about Julian, see their Chamber of Commerce Web Site. If you want specific info about the wineries and tasting rooms in the area, including times of operation, click here. 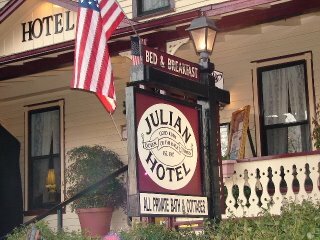 It's also a great site for photography... as you'll hopefully see from my Julian photos. 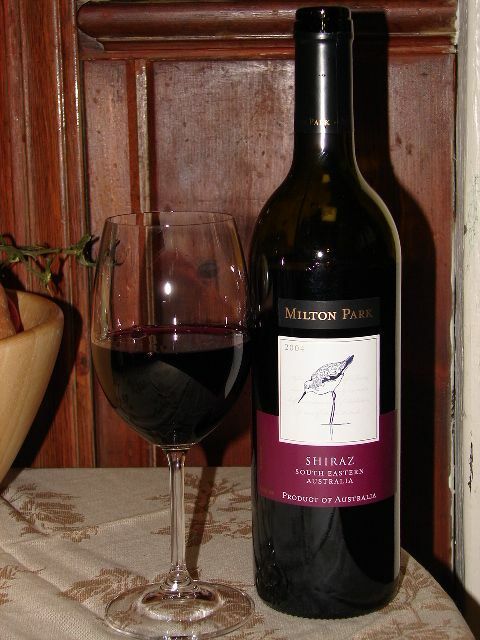 This was last night's wine - Milton Park Shiraz, 2004 from South Eastern Australia. 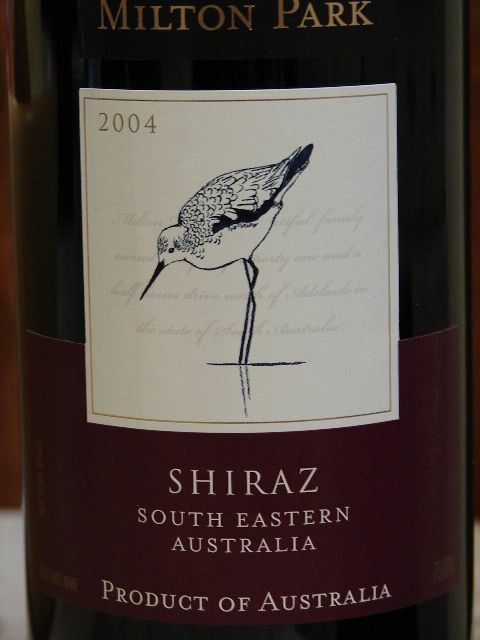 I've found that Australian wines are generally a good choice, and especially for a shiraz. In fact, I can't think of a really BAD Australian wine that I've had. I spent a couple of years drinking the Yellow Tail brand, which now seems to be everywhere. Anyway - about this wine... The label describes it as having "spicy characters and rich, plummy fruit flavors which are typical of this variety." I thought that was a pretty dead-on description. Here were my notes after tasting it: "deep purple color, smells bold, big, fruity and smooth taste." It was the sort of wine you can have with food (pasta or steak would be good choices) or by itself. I had it with chips and salsa - Tostitos Hint of Lime chips and medium salsa (any hotter would have obliterated the taste of the wine). All in all, well worth the $8.96 that it cost at bottle buys. Bottom line - you probably will not go wrong with an Australian shiraz - of any brand. "Wine is the most civilized thing in the world." -- Ernest Hemingway. I will confess. Until I was in college, I thought that Manishevitz was actually wine. You know Manishevitz - the wine that is traditionally used for Passover in Jewish households. Jews are not generally known as big drinkers -- anyone who has tasted Manishevitz will understand why. Traditionally, we got the sweetest and heaviest of the Manishevitz line -- Extra Heavy Malaga. Imagine a cross between fortified grape juice and pancake syrup and you'll get an idea of the taste - plus it's got that little "kick" at the end, sort of reminiscent of flavored Schnaps. If my parents are reading this, I apologize. I know you still enjoy your Manishevitz... even when it's not actually Passover. But I have graduated. 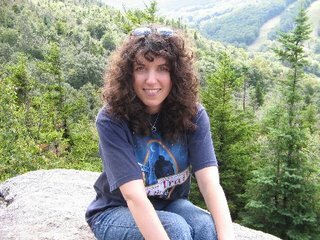 The 1980's was the decade of school for me -- high school, college, and then law school. Through most of those years, I drank what students drink - mixed drinks, beer (which I never actually liked) and White Zinfandel. Yes, White Zin. In the late 1980's that was my choice of wine. (It's interesting to note that there seems to be a natural progression from manishevitz to white zinfandel -- that appears to be my parents' choice of wine at this point.) Luckily, my white zin days didn't last too long. The 1990's were the beginning of my real appreciation for wine. I did what most people do - moved from white zin to chardonnay, and then pino grigio. Eventually I began drinking cabernet savignon and then merlot (before it was HUGELY popular), then shiraz, cabernet franc and pinot noir. I was fortunate enough to be working with some people who knew about wine, so when we went out for business dinners I was exposed to wines that I wouldn't have been able to afford to try. This decade has been the best yet for wine. I'm comfortable in my reasonably priced choices. I've discovered you can get some great, enjoyable bottles of wine for well under $10. I've traveled to wine country in California in 2001 and will be doing so again this July. It has been an interesting journey so far, and I welcome you to join me for the rest of this journey. In upcoming posts I will describe what I'm drinking that day, with explanations and reviews. I'll provide as much info about wine and health as I can find, as well as info about wineries and regions. The writer Robert Louis Stevenson said "Wine is bottled poetry" - join me in this ode to wine. Visit The Fearful Gourmet, my site devoted to food! Coppola renames his Rubicon Estate "Inglenook"